Astronautsthat spend long months aboard the International Space Station lose bonestrength faster than previously thought and have a higher risk of breakingtheir hips later in life, a new study reports. 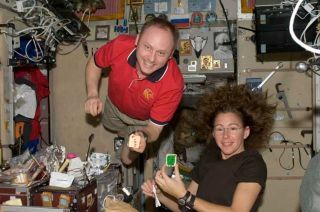 A survey of13 space station astronauts found that their bone strength dipped by at least14 percent on the average duringtheir half-year stays aboard the orbiting laboratory. Three ofthe astronauts lost up to 30 percent of their bone strength during theirlong-duration spaceflights, putting them on par with the bone strength of olderwomen with osteoporosis on Earth, the study reported. ?Ifpreventive measures are not taken, some of our astronauts may be at increasedrisk for age-related fractures decades after their missions,? said study leaderJoyce Keyak, an orthopedic surgery and biomedical engineering professor at theUniversity of California, Irvine. Keyak and colleaguesat UC San Francisco and the Universities of Space Research Assn. in Houstonused a new computer program designed to examine the risk of hipbone fracture inpeople with osteoporosis to analyze hipbone scans of one female astronaut and12 male astronauts. Paststudies have found that an astronaut?sbone mineral density can decrease by between 0.4 percent and 1.8 percenteach month. But Keyak?s investigation found the drop in bone strength, between0.6 percent and 5 percent each month, to be substantially greater. TheNASA-funded research is detailed in the online version of the science journal Bone. NASA haslong known that astronauts in space gradually lose muscle strength and bonedensity over time while on long-duration spaceflights because their bodies floatin microgravity, rather than work against the tug of Earth?s gravity eachday. To lessenthe effects, space station astronauts must exercise at least two hours everyday and undergoweeks of rehabilitation after their return to Earth. The hip andspine of long duration astronauts typically experience the greatest amount ofbone loss, researchers said. Hip fractures nearly always requirehospitalization or major surgery, while vertebra fractures in the spine canlead to loss of height, severe back pain and deformity, they added.